Ideal for a small family or a couple, Villa ROCHE BRUNE is a Simple, cozy, intimate and inviting Villa. 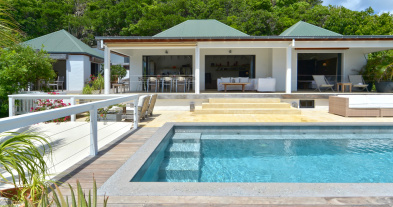 Villa ROCHE BRUNE is located on the heights of Anse des Cayes. 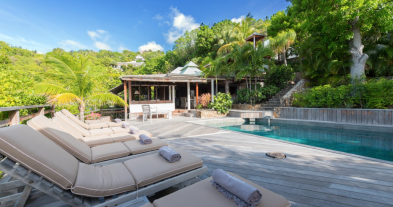 This luxury property, new to the holiday home rental market in St Barth, is discreet and welcoming, the kind of place where you feel at home. Its simplicity and its position within nature are the strong points. 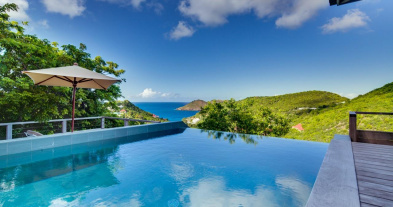 Most of the living spaces are open-air, which allows you to enjoy the Caribbean breezes and the green views of the garden. Ideal for a small family or a couple, Villa ROCHE BRUNE has a kitchen, relaxation and dining area with wooden tables and counters. Very glamorous luminaires in the shape of an ice cube. Small touches of red liven up the serene white space, both in the sofa cushions nestled around the television and in the hammock on the covered terrace. The terrace extends over a swimming pool and a lawn with deckchairs. The two bedrooms are furnished with elegant furniture, comfortable beds and Balinese artifacts on the walls. Equipped with a dressing room and ensuite bathroom. Fully equipped kitchen: Oven, Microwave, Espresso machine, Coffee maker, Centrifuge, Blender, Refrigerator, Ice machine, Dishwasher, Breakfast bar. Euro King bed, A/C, Key safe, Dressing room, Private bathroom, Iron, Ironing board. Small private terrace. Queen Size bed, A/C, Key safe, Dressing room, Private bathroom, Rain shower, Iron, Ironing board, Hair dryer. Small private terrace. 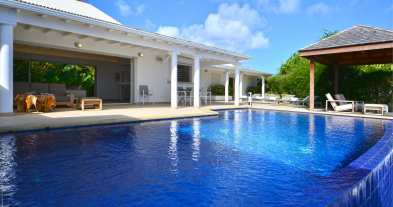 Swimming pool with steps, gas BBQ, sunbathing area, outdoor sound system, WiFi, coded entrance door.